Find pictures of Cedar Bark Tepee and discover interesting facts and information about the Cedar Bark Tepee. What was a Cedar Bark Tepee? A Cedar Bark Tepee was a typical structure used as a shelter or house style that was built by many tribes of the California cultural group who made them their homes. Learn about the structure and the interior of the Cedar Bark Tepee with pictures and images together with facts and information about the tribes who used them, including the Maidu, Miwok, Luiseno and the Southern Yana. What is a Cedar Bark Tepee? Definition: The Cedar Bark Tepee was built as a large semi-permanent shelter or as a smaller, temporary, make-shift shelter. This type of home can be described as pointed, conical cedar bark shelters, that were built using several poles tied together that were covered with bark and sticks over the framework. 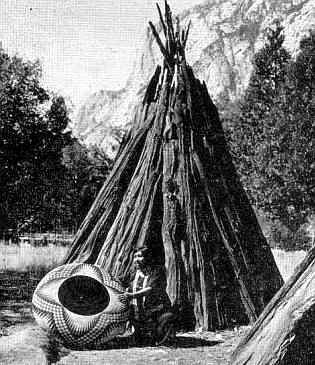 The Luiseno tribe of California called the cedar bark tepee 'kecha kachumat' meaning "pointed house". What was the Cedar Bark Tepee used for? The Cedar Bark Tepee was used as permanent and temporary homes for tribes located in California where timber was plentiful. It was constructed by using the natural resources that were available to some of the tribes who inhabited the area. Why was the Cedar Bark Tepee built as a Native Indian shelter or house style? Every tribe choose a style of housing to suit their lifestyle, the climate, and the natural resources that were available to them. The Cedar Bark Tepee was chosen as the most suitable type of shelter and house style for the Californian Indians because it suited both the semi-permanent and nomadic lifestyle of some of the tribes in California. The White cedar was the preferable material for building these tepees although elm, spruce, basswood and ash was also used. Like all cedars, white cedar is a member of the cypress family, but it was originally only known in Northern California and some parts of Oregon. It was a particularly strong, durable and hard cedar and, compared to other woods, was resistant to weather, rot and insects. How was a Cedar Bark Tepee built? The materials used to build a pointed Cedar Bark Tepee were saplings from the tree. Several straight saplings were selected, stripped and cut to size. The pyramid shaped frame of poles was made from the saplings that were propped against each other and tied together at the top. Cedar bark was then used to cover the poles to create a sturdy and durable covering for the tepee. There were two openings in the bark tepees. One was big enough to be used as a doorway entrance. The other opening was at the top of the tepee to allow for some ventilation inside the structure.